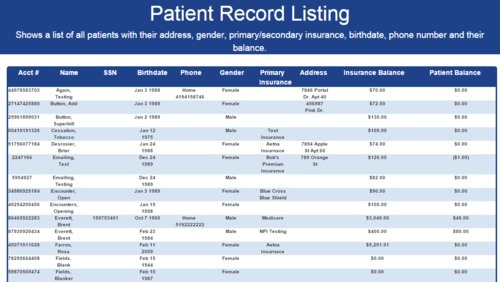 The Patient Record Listing report is an Advanced Report which displays a list of all patients with their address, demographic information, and balance information. This report also has a detailed version that will break down a list of all charges billed to a certain patient and the referring provider for that patient on that date of service. This report has two views, a Summary and a Detailed, that determines the amount of information displayed as described above. Minimum Balance - Filters the report by minimum balance. Please note that unfiltered results may load slower than filtered results.